A little over a year ago I posted about recovering my kitchen chair seats. It was a poor choice of fabric for a table that's the hub of our house. Three coats of Scotchguard were no match for a lethal combination of Playdoh, Ragu, and Crayola (washable markers, my foot!). I have been watching for oilcloth, but never found anything that suited my pocketbook or the colors of the adjacent room. I grabbed this bolt when Salvation Army slashed its $3.99 pricetag by half. If this nesting continues, I'll be stapling late into the night. Even though I'd still prefer a wipeable cushion, I know that an hour of my labor is truly money in the bank. My home is my job--and I have plenty of time to do it right. I appreciate the flexibility of being able to change the color scheme without fretting about a $40 investment in vinyl. When the next bowl of homemade soup cascades down the table, I can think to myself, "Oh, this fabric was only $2. Not even the cost of a Happy Meal." Adopting this kind of attitude is the key to cheerful frugality. Yes, it's a little extra work--but the extra savings, well, that works for me! Thanks for the inspiration. I need to recover our secondhand dining room chairs (they're WHITE! Some insane designer made WHITE cusions! I don't even have children yet and they're already beyond yucky.) I've been waiting for the most perfect frugal fabric ever, and ignoring them for over a year. I think I'll just recover them in what I have (got a ton of fabric at a yard sale for nearly free) and do better when I can. Thanks for the great work, and good luck as you start the adventure of your new little one! I love the colors in the new fabric, Meredith. The chairs will look pretty and fresh when you have company over after the new baby comes. (And isn't it amazing how you have more company when a baby is born, when you least feel like getting up and cleaning the house, than any other time in your life! Even though everyone says, "Now don't worry about the house", I always still do! 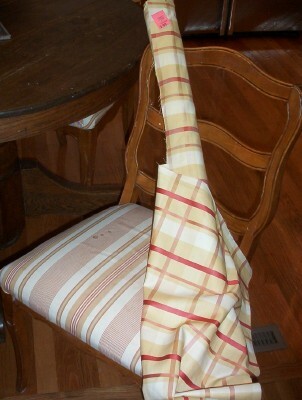 I have recovered my same ol' chairs for YEARS the same way, my bargain linen sage and white gingham is still beautiful. However, when my kids hit about ages 6 and 10, respectively, and the arts and crafts-and friends over era hit new highs, I relented and added a layer of frosted clear vinyl over the fabric, and stapled it under the seat board as well. Yes, Vinyl. I swore I would never! The frosting keeps it from looking shiny and obvious, but it's been 2 years since I had to take the seats apart to wash and restaple. Works for me! Hmmm...thanks for the tip! I've never seen the frosted kind. I tried the shiny kind once, but it kept tearing so I gave up. Will keep my eyes open next time I'm in Walmart! You inspired me to do some tips on my blog - I'll have to check out Rocks in My Dryer. I agree, washable markers my foot! I have the same trouble. Meredith, i can't find the frosted vinyl in Walmart. Got it at JoAnn's fabrics in the upholstery section, do you have Joann's down there? Prob other stores would have. It is also heavy, never has torn on me. When I only had one child with one set of friends, there was more time for restapling/recovering. It was the embarrassment of having adults stop over and just hadn't gotten to re-doing that stained chairseat that sent me down the vinyl aisle. I agree with Debbie - find some vinyl to put over your gorgeous fabric. I have recycled my vinyl just once when I wanted to change the fabric. It is definately worth the investment. Hi Meredith - Beautiful fabric! I have a question for you: how many thrift stores, garage sales, etc. do you frequent in a week? Do you have a system for checking in to look for deals? I love the fabric...it will look so nice. I buy fabric whenever I see it even if I don't have a specific purpose because I know it will come in handy someday. Beautiful fabric, and inspirational project. I've been wanting to do the same kind of thing with my la-z-boy rocker/recliner. The fabric on the seat of it has been disintegrating for the last few months at an unbelievable rate! I'd love any suggestions on how to pull off that project. Heather, I know it probably isn't the cheapest option, but it may be the least frustrating. Sure-fit slipcovers (you can google them online) makes some stretchy recliner covers that you can put on and still recline the thing. I've never bought from them, so take it with a grain of salt. . .